Above you see the valves and ends of the spark plugs, below we have the top of the two pistons. The area Bram is pointing out with a screwdriver is one of the sections that was clogged. After isolating the cooling problem somewhere into the head, it was time to go in and plan on finding some problem with the head gasket. In the passageway of the head where the water exits, there were heavy salt deposits -- soo much so that one of the passages was completely blocked solid, and the other one was also pretty clogged. We think(hope) that was the problem. 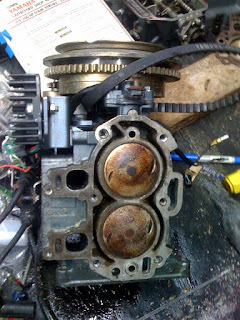 It looks like that could have been caused by the head gasket being previously 'repaired' instead of completely replaced. Picked up Yamaha part 682-W0078-01-00 (WATER PUMP REPAIR KIT) from Boats.net. Planning to replace the impeller(#21) and surrounding gaskets and seals. The kit included the parts below. UPDATE: Replacement was not too difficult, loosening the nut which connected to the shifting mechanism was the most difficult aspect. After taking the lower unit off, all of the parts below were replaced. This project was done because its something you should do every few years, but also water was not being pumped through the engine and therefore not cooling the engine properly. Unfortunately, it looks like there may be a problem somewhere in the head unit, so further investigation is now required.